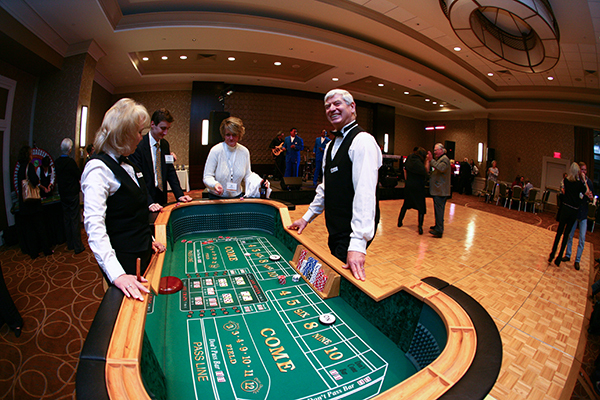 BRING A LAS VEGAS CASINO TO YOUR NEXT EVENT! We have all of the popular like Blackjack, Roulette, Craps, Chuck-a-Luck, Money Wheels, and Poker. As you enter the room you’re handed an envelope filled with Funny Money. You’re now ready to find your table, cash in your Funny Money for chips and become a Millionaire! Nothing beats the sights and sounds of a casino. People come alive with energy. We bring this fast paced excitement to you and your guests. Everyone loves Lady Luck! Watch our promotional video and you’ll see that we guarantee that your event will be a successful one. Whether you’re a graduating class, a Fortune 500 corporation or somewhere in between, we’ve delivered dynamic results for hundreds of groups like yours. We have the experience to customize your event, whether it’s for 50 or 5,000 guests. Our dealers are entertaining and love to teach as well. Looking for a single Blackjack table? Let’s fill Boston’s largest ballroom with our casino. Nothing is too big or too small. Our event manager will discuss every detail of your party with you. Your success starts with your first phone call. WOULD A CASINO PARTY WORK? Do you want enthusiastic support for your charity, a dramatic way to break the ice among guests, or just a reputation as a great host? There’s no denying the excitement created by the magnetism of the green felt. Make that excitement work for you. Whether it’s for a personal celebration (birthday, bar / bat mitzvah, Anniversary, etc. ), company event or a fund raiser, you’ll want exceptional entertainment. Let us entertain you! Give us your complicated schedule. Throw us your most outrageous demands. Let us teach your beginning gamblers. We’ll show you how to make it all work. You provide the empty room. We provide the success! Give us your complicated schedule. Throw us your most outrageous demands. Let us teach your beginning gamblers. We’ll show you how to make it all work. You provide the empty room. We provide the success!